Panasonic Toughpad FZ-E1 - Wi-Fi (802.11a/b/g/n/ac), Tablet, 2D Imager (SE4750), Windows Embedded Handheld 8.1, 5" Screen, 10-pt Gloved Multi-Touch, 2GB/32GB, Qualcomm MSM8974AB 2.3GHz Quad Core, Bluetooth, Webcam, 8 Megapixel Camera, Near-Field Communication. Interface cables and charging cradle sold separately. AC Adapter (Part# CF-AA6373AM). Single slot charging cradle (Part# FZ-BCRD111). Quad slot charging cradle (Part# FZ-VEBX121M). The Toughpad FZ-E1 is the world's most rugged 5-inch tablet and a whole lot more pairing military-grade toughness and enterprise-class mobile computing power with Windows Embedded 8.1 handheld OS. Now mobile workers in the most demanding environments can have all the computing power they need in a handheld tablet small enough to drop in a pocket. 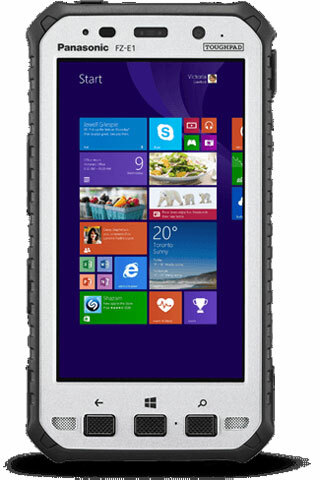 Built on the rock-solid foundation of the Windows Embedded 8.1 Handheld OS, the FZ-E1 lets businesses leverage their existing investments in enterprise applications without sacrificing performance and ruggedness. The Panasonic FZ-E1BCCAZZM is also known as PAN-FZE1BCCAZZM	or FZE1BCCAZZM	.